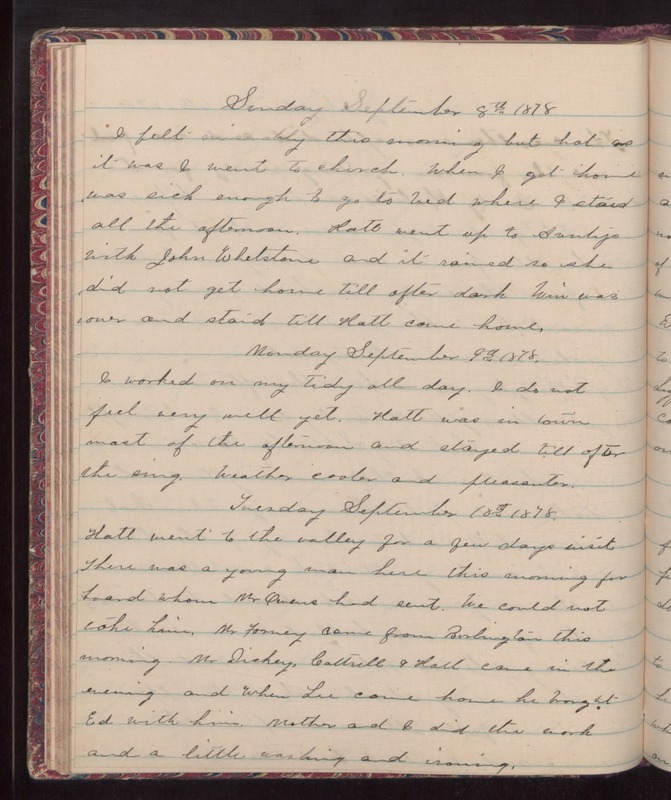 Sunday September 8th 1878 I felt miserably this morning but hot as it was I went to church. When I got home was sick enough to go to bed where I staied all the afternoon. Hall went up to Auntys with John Whetstone and it rained so she did not get home till after dark. Win was over and staid till Hatt came home. Monday September 9th 1878 I worked on my tidy all day. i do not feel very well yet. Hatt was in town most of the afternoon and stayed till after the sing. Weather cooler and pleasant. Tuesday September 10th 1878 Hatt went to the valley for a few days visit. There was a young man here this morning for board whom Mr Owens had sent. We could not take hm. Mr Forney came from Burlington this morning. Mr Dickey Cattrell & [Hatt?] came in the evening and when Lee came home he brought Ed with him. Mother and I did the work and a little washing and ironing.